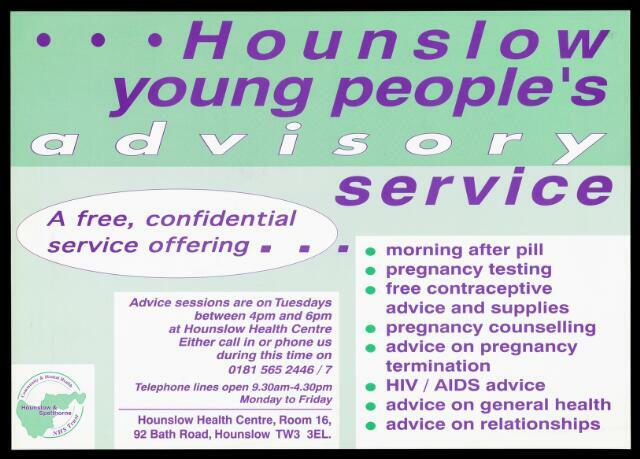 Services of Hounslow young people's advisory service including advice on HIV/AIDS. Colour lithograph. Hounslow and Spelthorne Community and Mental Health National Health Service Trust. Hounslow young people's advisory service. A free, confidential service offering ... advice on relationships. Hounslow & Spelthorne Community and Mental Health NHS Trust.